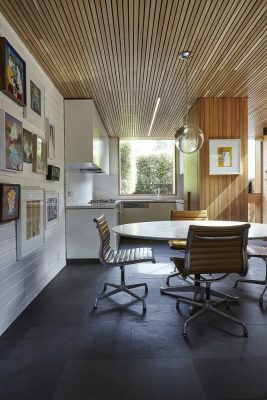 Transforming a compact 1970’s inner city townhouse into a light filled home, Thomas Winwood Architecture, has created a peaceful and highly functional home. A tactile and finely detailed modernist aesthetic results in a seamless transition between old and new. 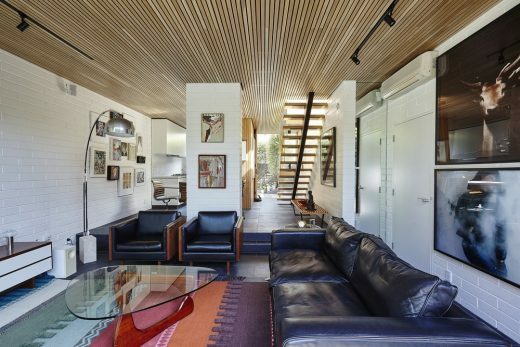 The owner, who grew up in a modernist house designed by his father, wanted a space that reflected the character and feel of Australian mid-century modernism. 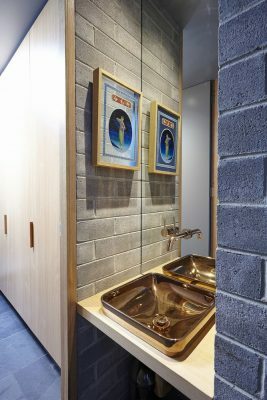 Inspired by the honesty of materials and detailing typical of Australian mid century design, a considered use of materials achieves a high level of finish and durability on a modest budget. The compact size of the residence required a thorough understanding of the clients requirements and for every detail to be carefully considered. The result is a project where no detail was overlooked and functionality greatly improved. 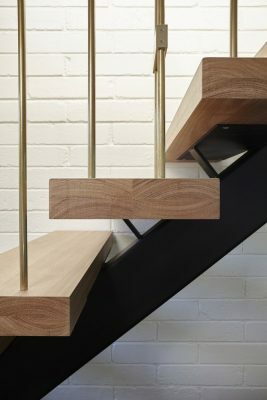 An exquisite, finely detailed brass handrail adds a level of drama and quality and catches the western sun as it comes through the first floor window into the centre of the ground floor. Subtle yet effective changes to the existing openings allow light to enter into the centre of the house dramatically altering the quality of light in the interior. 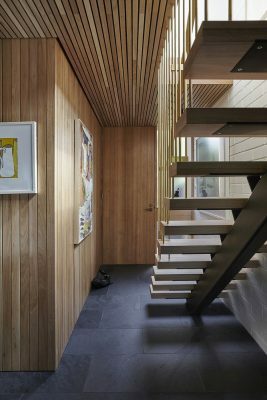 A new oak timber batten ceiling and slate floor reinforce the desired modernist character of the house and provide robust materials that give the project an honest and durable character. 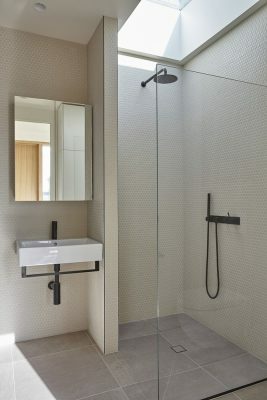 Three external spaces, a carefully designed kitchen and new bathroom create spaces that defy the limitations of the original house, subtly drawing the interior out and exterior in. 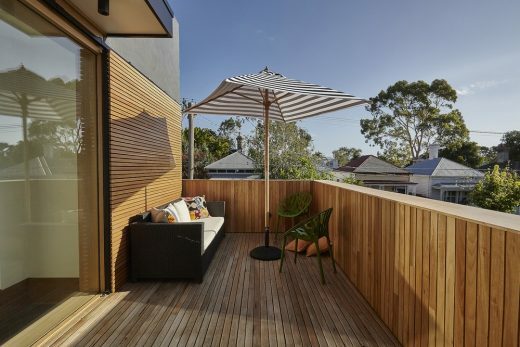 At the top of the stairs a timber lined roof deck provides city views and surprising external space on a small block. The project rejuvenates and enriches the character of a previously unremarkable building. 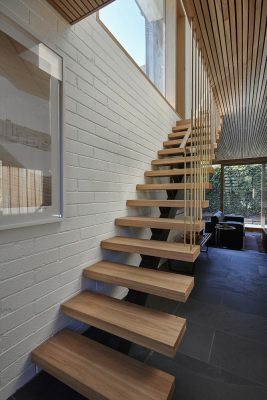 The design improves the lives of the inhabitants and continues a tradition of poetic Australian modernist architecture. What is/was unique or interesting about the site of the project? 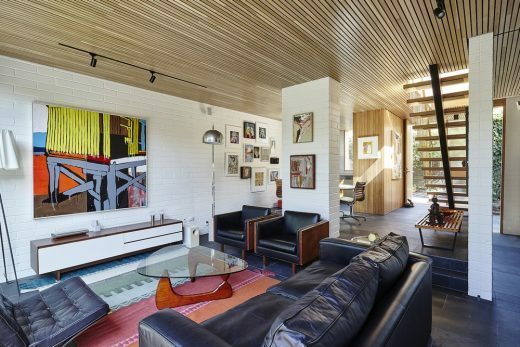 The scale of the site and poorly planned kitchen and bathroom gave the original house a compact feel. A key challenge was to revise the internal layout of the project and modify the existing windows to create a sense of spaciousness, openness to the three external spaces and sky. Achieving a high-degree of functionality results in spaces that do not feel compromised by their reduced scale. Tell us a little about the client/s – who are they and what (if anything) is unique about them? The clients were a well travelled a couple living overseas with their dog. With a background in retail design the client had an excellent understanding of architecture and a clear vision for the project. They engaged us as a residential architect to help develop, refine and realise their vision. The design and documentation stages of the project were completed whilst the clients were overseas using Skype and email with them returning when the project has started on site. When did the project begin and when was it completed? What factors affected the timeframe? The project was completed in 13 months from the first conversation to moving in. A mutual understanding of the goals of the project and excellent dialogue via email allowed the project to maintain its momentum. What are the elements of the project contributing towards sustainability (in all its forms)? As a sympathetic renovation of an existing building the project is an excellent example of what can be achieved when the potential of the existing is harnessed and brought to life through new interventions within the space. New insulation, new double glazing, new openings to improve daylight, improved cross ventilation, harnessing thermal mass and appropriate and long lasting materials greatly improve the sustainability of the existing house. Energy efficient appliances and fixtures, LED lighting help reduce the energy requirements of the project. LOW VOC paints, FSC certified timbers and re-use of existing split face concrete blocks and pavers further promote the use of sustainable products. The modest scale of the project, 131m2 floor area, is an example of what can be achieved in a compact residence. The project will hopefully encourage the design of clever and effective smaller residences that are well built with robust materials and subsequently contribute to increasing their appeal. 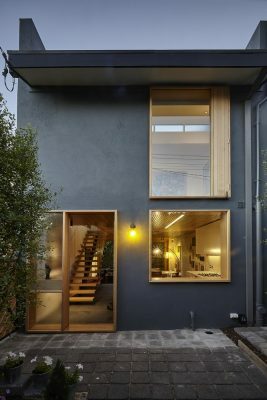 As space becomes precious in inner city urban environments exemplary projects that show how design can make a valuable contribution to the success, sustainability and liveability of smaller houses and apartments are vital.